Quick search for properties in Lincoln Park. Click on the links below. Named after Lincoln Park, a vast stretch of park belonging to the Chicago Park District, the community area is anchored by the Lincoln Park Zoo and DePaul University. Although boundaries are not precisely defined, the Lincoln Park neighborhood is generally considered to be bordered on the north by Diversey Parkway, on the west by Clybourn Avenue, on the south by North Avenue, and on the east by the public park of the same name. There are many boutiques, movie theaters, retail stores, restaurants and coffee shops. 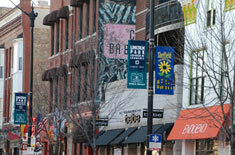 There are also many bars and clubs in the area, especially along Lincoln Avenue between Diversey and Armitage. In 2007, Forbes Magazine named the area between Armitage St, Willow St, Burling St, and Orchard St as the most expensive block in Chicago.